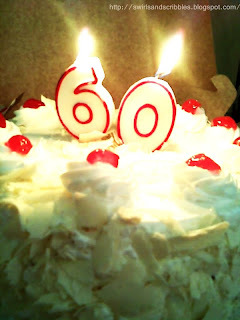 Yesterday, "Nanay", the yaya of my sister and our kasambahay, celebrated her 60th birthday. I know she is turning to be one of the golden girls(i mean Old). She is always telling us that by the time she reached the age of sixty, she will retire. She is hard working and very trust-worthy. She is serving us for almost eight years, from the day I entered high school until now that I will be graduating this coming March for college, she is still there giving us the service we need. Last time she told me that maybe this coming month of May, she will be retiring. She will be going back to Sorsogon or stay at their house at Cubao (i guess). I remembered, she said with tears in her eyes, "Alam nyo napamahal na kayo sa amin, hindi ko na rin kayo tinuring na iba, mamimiss ko kayo pag alis ko." wow! I was shocked with the crying moment. I will surely miss her too. Nowadays, it is hard to find someone like her, even though she is old she still have the strength to clean and cook. I admire her honesty. I never lost a dime coz' there are times that I just left my money somewhere in my room and I will still find them in the place where I left it. If she change her mind, we will still accept her with open arms.